Home is where we raise our families and experience most of life's greatest joys. It's where the vast majority of our memories are made. We'll never forget that. Tom doesn't finish houses, he finishes homes. 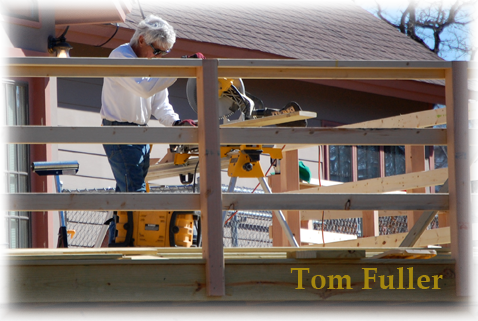 Tom has over thirty years of experience in custom finish carpentry, stairs and home improvement. He understands the unique requirements for each job. Let us help you find the right solution for your next new construction or home-improvement project. Whether it is cabinets, a deck, custom shed or gazebo, you can rest assured that your job will be completed with professionalism and quality workmanship. Trim and molding is one of the best ways to give your home a little update. If you don't have crown molding in your home or need to replace yours, finding a carpenter is the best way to start. Moldings can open up a room and give it a classy and unique look. Add beauty and elegance to your home. Even small wood repairs or wood projects that you need, Tom can take care of that too. Wood means endless natural beauty and it takes an appreciation for that beauty to make a fine quality wood product. Carpentry is an art and custom cabinets, decks, sheds or gazebos can be created to meet your style and design specifications. Have one of the best carpenters in your area who will do their best to make your carpentry project into what you have been dreaming of. All of his work is guaranteed to meet your satisfaction. Many things have changed in the past two decades of new-home construction, but one thing has not: our commitment to quality, creativity and excellence. The difference between a craftsman and a worker is passion and attention to detail. We don't just do what we know, we do what we love. That makes all the difference. Tom Fuller is that kind of craftsman. Call, text or email Tom today to get your project started!.